A fair number of individuals are not getting emails from ZOA because of the email address it is sent from. Please add the email address noreply@oakartcc.org to your white list/ approved list/ not spam list to get our future emails. If you don’t you may miss important staff announcement emails, training notes and more. 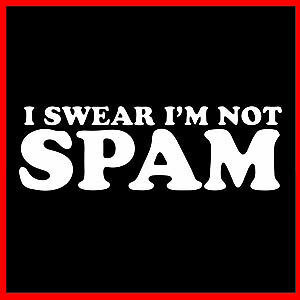 I promise we aren’t spam! We taste much better. This entry was posted in Staff Announcements on 29th May 2014 by By Ryan Parry. Join me in welcoming, and congratulating, Dominic Nguyen as the newest Staff Instructor at Oakland. Dominic has been a dedicated controller and mentor for a while now and his time to step up has finally came. He’ll be a great asset to the training department and I am very excited for him. I have high hopes for this outstanding instructor and I look forward to seeing the next generation trained up under his tutelage. This entry was posted in Staff Announcements on 27th May 2014 by By Ryan Parry. The training staff has released new cheat sheets for SFO, OAK, SJC, SMF and RNO that include basic information for all positions (GND, TWR, APP and even CTR). They’re created in a neat PDF format and are ready for you to download them now in the downloads section of the website! We hope you find these useful and keep them handy while controlling! This entry was posted in Staff Announcements on 11th May 2014 by By Ryan Parry. With the launch of our new site we also roll out our use of the new “climb via SID” phraseology the FAA implemented about a month ago. There has been discussion among the FAB regarding the use of the phraseology and we think we’ve got it set the way we like it without making it too difficult. This entry was posted in Policies and Procedures, Staff Announcements on 8th May 2014 by By Ryan Parry. On behalf of the vZOA Staff, I want to welcome you into our new, redesigned website. We hope you’ll enjoy the new look as well as the improved features we will have available to use. I will tell you more about those things in an upcoming post. I’d also like to thank the staff members who helped out a great deal in bringing this project to a successful completion. That especially goes to our TA Ryan Parry, who did a ton of content creation & migration work in the past few weeks! If you have any questions or difficulties in using the website, you can send me an email at webmaster@oakartcc.org. This entry was posted in Staff Announcements on 7th May 2014 by By Chuck Barlow. vZOA 17.4 is now available for download! All controllers are expected to upgrade their sector files! The new update contains the updated MOD5 and more video maps available to use. This entry was posted in Staff Announcements on 10th April 2014 by By admin. ZOA Has a New ATM! Please welcome our DATM, Chris Mauro, who is now taking the new office as the Air Traffic Manager! Enjoy the new office and leather seat Chris! This entry was posted in Staff Announcements on 29th January 2014 by By Chuck Barlow. Checkout our brand new vSTARS NorCal Approach file in our downloads area (ATC Training->Downloads)!!! Just a reminder that instructors/mentors will continue to only teach on VRC at this time. Thank you for understanding! This entry was posted in Staff Announcements on 15th January 2014 by By Chuck Barlow. Ryan Parry has moved up to become the Events Coordinator – Congrats!! Please congratulate him in the forum. This entry was posted in Staff Announcements on 25th October 2013 by By Chuck Barlow. KOAK – Oakland Metro Intl has changed its runway numbers effective 10/17/2013 (AIRAC 1311). More info can be found in our NOTAM section of our forum. This entry was posted in Staff Announcements on 18th October 2013 by By Chuck Barlow.